Easter Monday was a legal holiday in the Bahamas. Everything in town was closed. So we continued our boat projects. All week-There is always cleaning and laundry to do between guests. Plus there were some projects that needed attention. Joe and Erin had brought some boat parts for us. So Dave worked on several things this week. We decided to buy the Portland Pudgy boat. We stopped at Spanish Wells Marine and Hardware and talked to Edmond. He said to come back in a few hours after his mechanic had tested the Mercury motor. We walked to a new restaurant to us, the Vault Shack. There was a window to place your order. Then they had tables outside with a tent covering them. We tried their special, the Vault burger. It was by far the best hamburger we have had in the Bahamas. It had their special sauce, lettuce, tomato, french fried onions, cheese and bacon on a fresh bun. Way too big, but very good. 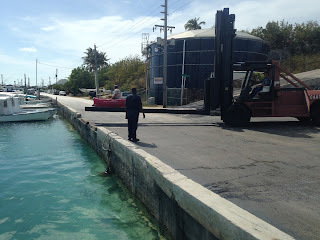 Back at SW Marine and Hardware, we filled diesel and gas cans before finalizing the deal for the boat. The mechanic had the motor running in a water bath especially for that purpose. He thought it was good. 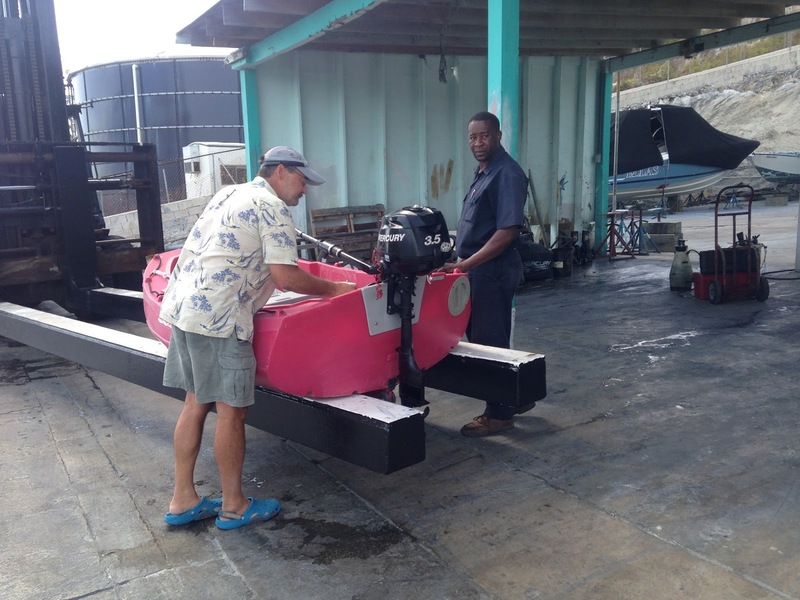 Dave and a couple other guys lifted the boat onto a fork lift made for boats. 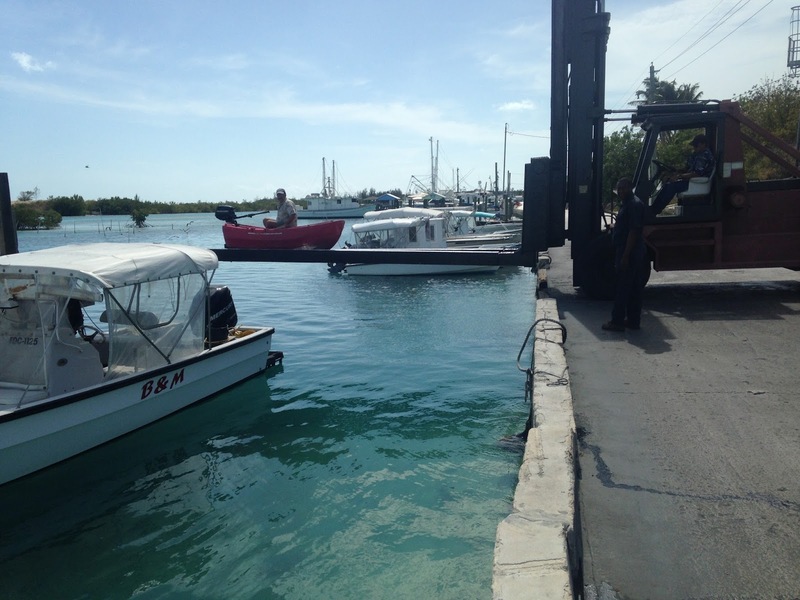 Then they mounted the motor onto the boat. Dave climbed in, and they took him over the water and lowered him into the water. It was funny to watch. We were glad to see the boat floating. As Dave was starting the motor, he realized the drain plug wasn’t in. So he had to deal with that right away without drifting into another boat. 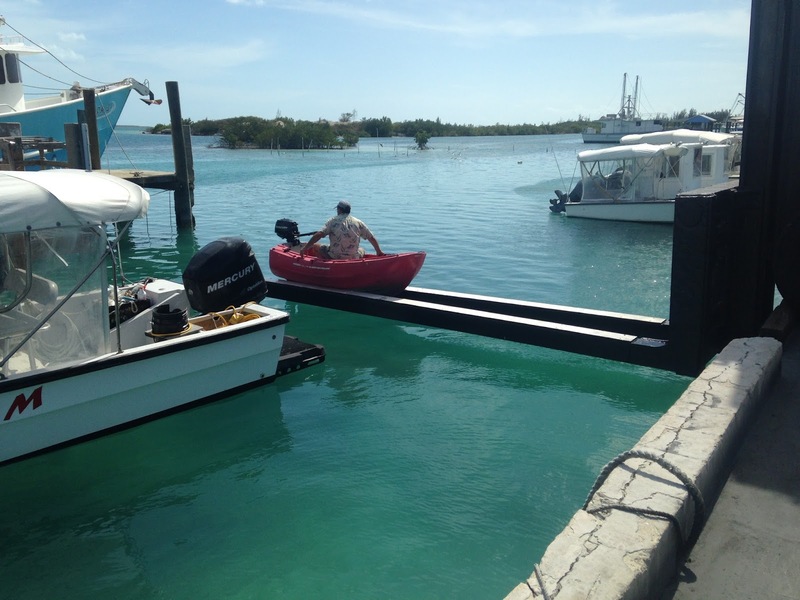 He motored it over to our other dinghy at the fuel dock. 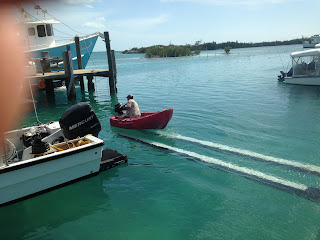 After we finished with our financial transactions, he took a life vest and the hand bilge pump and headed to our boat. I followed him back. Halfway there, his motor died. Luckily, he figured out that the gas tank needed a little air. Once he loosened the cap, it ran fine. Now we have to figure out how we are going to stow it on our boat. 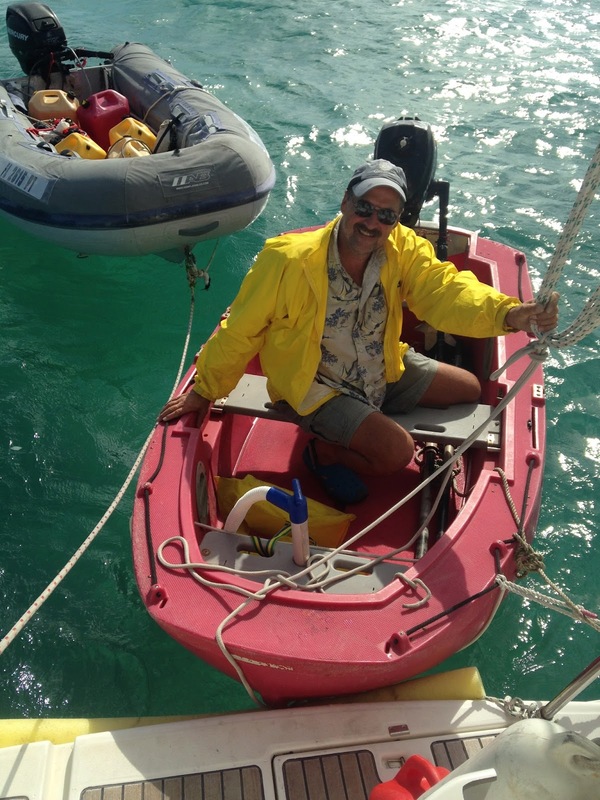 Dave in now the captain of our 3 boat fleet! We hand washed laundry and hung it out on 3 different days. A young German couple saw it hanging out and stopped by our boat to ask about laundry in Spanish Wells. They had two bags in their boat and couldn’t find any public laundry in town. We didn’t think there was any either. Earlier this year, there was a small grocery store with one washer and dryer for the public. But that store was closing, so we were assuming the machines were no longer available. They figured they would end up hand washing, too. Just wanted to ask. We go through about 10 gallons of water per load (5 gallons to wash and 5 to rinse). 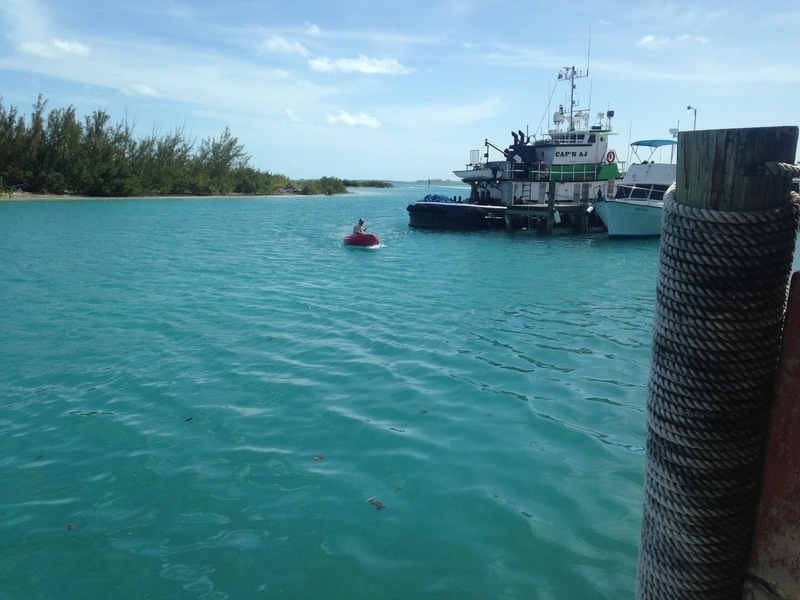 If we didn’t have a water maker, that would be a lot of water to haul to our boat in 5 gallon jerry cans. It was interesting to talk to the German couple. They looked like they were around 30 years old. They had a smaller boat than ours. They sailed from Baltic Sea area to the Caribbean last November. Then they spent the winter/spring traveling up the Caribbean. Now they are headed to Bermuda and back to Germany and back to their jobs. They thought crossing the ocean was no big deal and encouraged us to sail to Europe. We went back into town to check with Edmond on some additional parts that he had for the boat. They were stored at his son’s house. He still hadn’t located them and said to check back this afternoon. We decided to go back for another Vault burger. We decided we must have been real hungry when we first tried these burgers. Today they seemed extra large. We will probably share one if we return. We were walking off our hamburgers on the way to the grocery store when an older gentleman stopped and offered us a ride in his golf cart. He was known as Captain Burg. When he found out we were from SD, he said he went to Wisconsin during “the war” to work on a dairy farm. We were assuming WWII. He said the US recruited Bahamians to work in the US because all their men fighting in the the war. He said the white men went to Fond du Lac, Wisconsin to work on dairy farms. And the black men went to the south to work on fruit farms. We meet the most interesting people. We picked up non perishable groceries today. We’ll stop back on Saturday, after our next guests arrive. We’ll get our perishable items then. Also it’s interesting for people to see what’s available. We let them decide if there is something they particularly like. We walked across the island to the dock side. I sat with the groceries while Dave walked back to the dingy. Still nursing that shoulder. Dave also stopped to talk to Edmond. He still hasn’t located the missing parts. He said they were straps for hanging the Pudgy on the davits. He’ll keep looking. Back at the boat, Dave got out the sewing machine to repair a few spots on our bimini. 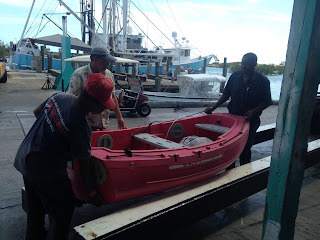 There is always some work involved with storing food once we return to the boat. Then I finally spent some time on the computer updating this blog. We will have a busy month with 3 sets of guests. So stay tuned. We spent the day on last minute clean up, projects and cooking for guests. I remembered how Torben, from Denmark, really liked Rice Krispie Treats when they visited us in SD. You don’t want to know how much Rice Krispies and marshmallows cost in the Bahamas. But I did find them. Can’t find pretzels in Spanish Wells or canned potatoes. No rhyme or reason on what they stock from island to island. Dave went to town for more fuel and to buy additional gas cans. We have been using our Honda generator more often, which uses gas. And now we have a second dinghy with another gas motor. 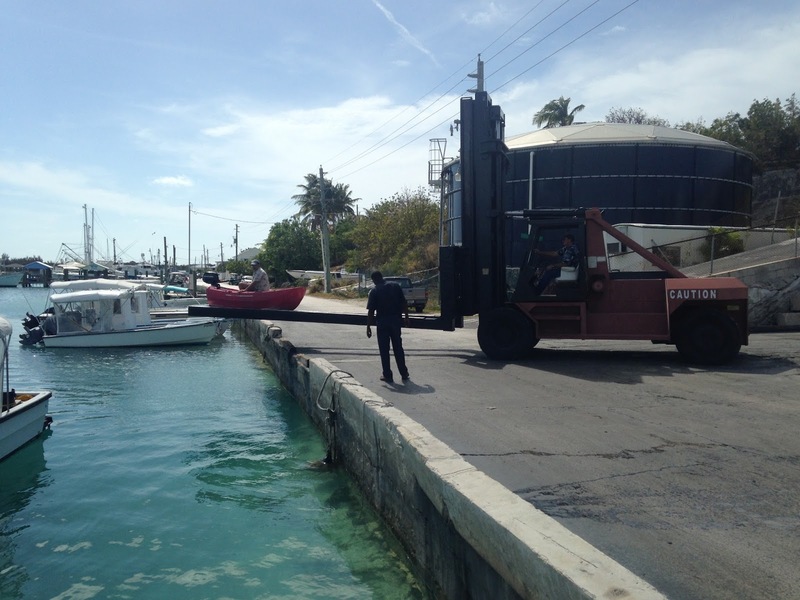 We will want to carry a gas can in that dinghy. Dave invited the German couple over to give them some fresh water. They are leaving for Europe soon and the water in Spanish Wells is salty. So we gave them water that we make with our water maker. They stayed and visited for about an hour. Long enough to have fresh bread out of the oven. They gave me some hints on how to get a nice hard crust like German breads. They recommended wetting the surface with water (I had tried that once) AND starting at a higher heat and then lowering it to normal. That I am going to try. The day went by too fast. We may have to get up early to finish preparing for our guests. They arrive about 1:30 tomorrow.